The back woods of Eryri continue to reveal bouldering treasure. The latest addition to the roster is the pristine Ciwb Siwgr/ Sugar Cube, located in the forested hinterland of Rhyd. 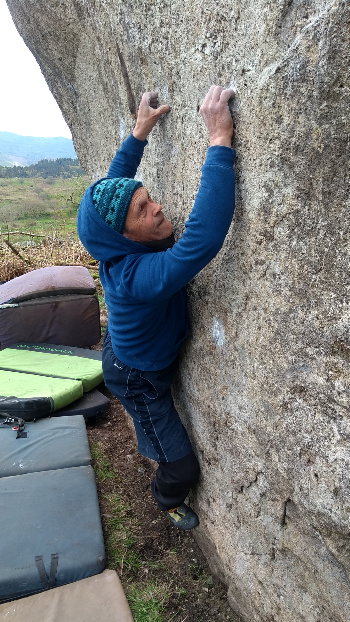 Martin Crook made the initial discovery and picked off a few of the obvious lines: the slab round to the left became, The Tracks of my Smears 6A+ and the groove just left of the main face, Sugar Cube Groove 6A+. He then applied himself to the intense, fingery traverse. Kowloon Tong runs left-to-right, swinging around the arete and crossing the wall on small, directional holds; it rates 7A. The striking bow-shaped arete is a great feature but does require blinkers (the back left arete is out of bounds). Dave Towse got the stand up: Flibbertigibbet 6C. Pete Robins added a sds at 7Aish, but his main attention was focussed on the striking central line, moving up past the incredibly sloping shelf. 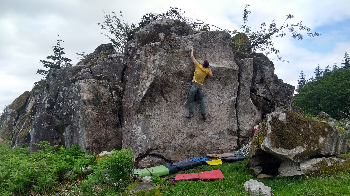 First session was plagued by dampness and midgies but Pete returned, on a fresher day, refined his sequence and topped out on one of the best problems in North Wales. The Cube rates 7B+.